Kolkata, Apr 30 : Normal life was affected in West Bengal today following a state-wide 12-hour general strike called by Left Parties and trade unions, with the BJP also calling a 10-hour bandh to protest against alleged violence by ruling Trinamool Congress in the recent civic polls. Eastern railway officials here said that suburban services in the Sealdah south section were hit for due to blockades at some stations. Comrade Ananta Bhattacharjee is the All India President of All India BSNL DOT Pensioners Association since its inception. He retired during the DOT period. He was the Circle Secretary of the AITEU Class III Calcutta Telephones for a long period. Though above 80 years, he is still very active and carries over his responsibilities very effectively and efficiently. In the just concluded CEC Meeting of AIBDPA also, as usual, he guided it to take correct concrete decisions. Very simple living and high thinking are his habits. I have a very long association with him. I got the opportunity to renew it at Jamnagar. We parted with a cup of tea when he started for the Railway Station to return to Kolkata. Minimum Pension of Rs.1,000 restored. The central Government has issued orders restoring the minimum pension of Rs.1,000 to EPS pensioners with effect from 01-04-2015, after the central trade unions recorded strong protest. Last year the government took decision to increase minimum pension to Rs. 1,000 but only up to March 2015. Communications Minister calls for Better Service. Bharat Sanchar Nigam has been told to improve services and ensure that better quality of signal is maintained specially in the border and extremism affected areas. Union Minister for Telecom and Information Technology, Sh Ravi Shankar Prasad said these at a meeting with the members of Parliament from the States of Bihar, Meghalaya, Manipur and Nagaland. The meeting was part of the series of meetings planned to make telecom officials directly answerable to the parliamentary representatives so as to have a firsthand account of public sectors performance, problems faced and possible solutions. The Union Minister for Telecom and Information Technology, Mr. Ravi Prasad said while the Government is committed to revive BSNL and numbers of initiatives are in the pipeline to bring it back to the position of market leader. He said the management of BSNL will also be expected to regain lost confidence of people by improving services and response. He said a major initiative has been launched by BSNL to improve quality of signal for which it plans to add another 1150 towers during this fiscal in Bihar alone. Members of Parliament from the States of Rajasthan, Himachal Pradesh and North Eastern States participated in the first meeting. Mr. Prasad has directed the Department to call five such meetings so that all members of parliament are given opportunity to raise issues directly with officials concerned. Members of Parliament who attended yesterday’s meetings gave overwhelming support to Mr. Prasad initiative to revive glory of BSNL and categorically stated that they are eager to extend all support in this context. They were not only concerned about the deteriorating quality of BSNL services but even apprehended private players role in obstructing growth of BSNL which enjoined lead position in the sector till 2004.They only suggested that meeting of representatives from Defence and Home should be called to address this problem. Mr. Prasad also directed the Department of Telecom to explore the possibility of setting up a dedicated cell in BSNL to monitor the effectiveness of its network in border areas and also in areas badly affected by extremism. The meeting was also informed that the public sector which came into being only in October 2000 has a net worth of Rs 51,203 crore with an equity capital of Rs 12,500 crore only. New initiatives taken to improve viability include Wi-FI services, data centre services and introduction of next generation network switching technology. It was pointed out that four million lines in phase -I will have NGN by the end of this fiscal while total number of 14 million ports are planned. 2500 hot spots are planned for the year of which 41 hot-spot have already been deployed. Pious Statements are appreciated. But this should be continued with actions supporting BSNL, which is lacking now. Red Salute to Comrade P.Sundarayya on his 102 Birth Anniversary. 1 May 2015 is the 102 Birth Anniversary of Comrade Puchalapalli Sundarayya, veteran Communist leader and first General Secretary of the CPI(M) elected in 1964. He was born on 1st May 1913. His Birth Centenary was observed by the CPI(M) last year with many programmes through out one full year. Com. P.Sundarayya was the leader who was part of the formation of the Communist Party in South India. He was the unquestioned leader of the Telengana struggle against the Nizam government and for the rights of the kisans and workers. He was a Member of Parliament and was also the opposition leader in the Parliament. Rd Salute to the memory of Comrade Sundarayya! One more May Day has arrived. May Day is the symbol of the struggle of the working class for their rights and right to live with dignity. The struggle of the toiling masses through centuries to reduce the working hours, to break the shackles put on them, for getting a wage to live and social security – all are included. The slavery of the working class since Roman times or earlier has been removed in name, but even now there are millions and billions of slaves of the modern era toiling in almost all countries. The Child labour continues in a big way. The neo-liberal capitalist policy being aggressively implemented in many countries including India, the unipolar system with the USA at its head creating war and tensions world over, the austerity measures being implemented in the European and other countries – all these have created a challenge for the working class. On May Day, the International Day of the Working Class, we remember the great and ultimate sacrifices made by the working class to usher in a socialist society, where all are equal and every body is cared for. Today the capitalist system is able to have its hegemony. But history has shown that such exploiting system can not continue for long. Ultimately Socialism will win, there is no doubt. Let all of us make all our efforts towards that goal. Revolutionary Greetings and Best Wishes to all on May Day 2015! The Central Executive Committee meeting has concluded today with the clarion call to help the worst earth quake victims of Nepal and North India by collecting donations by branches and sending the amount directly to the relief fund. The CEC also decided for two phased agitational programme demanding lmmediate issuance of order on extending the benefit of 78.2 per cent IDA merger and restoration of medical allowance. 1. Post card campaign to Prime Minister during third week of May, 2015. 2. Two days relay hunger fast before the CCA offices on July 21,22, 2015. The interim report and accounts were adopted unanimously after the reply to discussion by Com.K.G.Jayaraj, General Secretary.Com.V.A.N.Namboodiri spoke emphasising the importance of stengthening the organisation. The CEC decided to hold the next All India Conference in Andhra Pradesh. Resolutions presented on important issues by Coms.Susata Ghosh and R.Aravindakshan Nair were adopted. The reception committee had made excellent arrangements which made the CEC memorable. We send herewith a copy of the resolution adopted by the massive rally of the Central Government employees held today 28.4.2015 at Jantar Mantar. New Delhi declaring that if no settlement is brought about on the ten points charter of demands, the Central Government employees in all the De-departments of the Government of India will go on indefinite strike action from 23.11.2015. The rally was held under the chairmanship of Shri M. Raghavaiah, General Secretary, National Federation of Indian Railwaymen. Shri Shiv Gopal Mishra convenor of the NJCA conducted the proceedings. The resolution was moved by Com. K.K.N. Kutty, President, Confederation of Central Government employees and workers, New Delhi. Besides, the Chairman and Convenor of the NJCA, the other who spoke at the rally include S/Shri Rakal Dasgupta, President, All India Railwaymen Federation, Guman Singh and Bhatnagar of the National Federation of Indian Railwaymen, Shri M. Krishnan, Secretary General, Confederation of Central Government employees and workers, R.N. Parashar, Secretary General, National Federation of Postal Employees, Shri D. Theagarjan, Federation of National Postal organisations, Shri Sreekumar and Pahak of All India Defence Employees Federation, Srinivasan of the Indian National Defence Workers Federation, Harbhajan Singh Sidhu, General Secretary, HMS and many others. It was decided that the Railway and Defence Federation will take the strike ballot in the month of October, 2015. 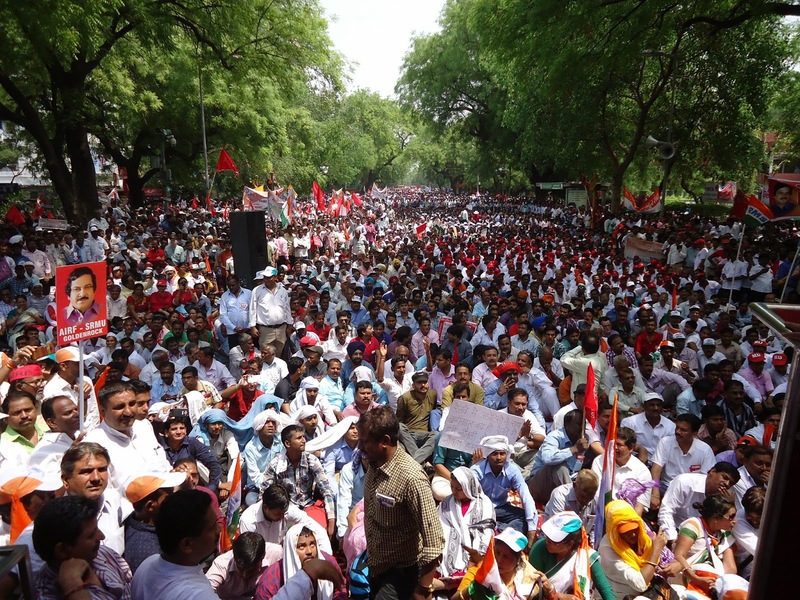 More than a lakh of workers participated in the rally. The copies of the resolution were handed over to the honourable Speaker, Lok Sabha and the Honourable Prime Minister by a delegation of the National Joint Council of Action. Thousands and thousands of Central Government employees marched to Parliament today, 28th April 2015, demanding the settlement of their demands by the Central Government. Such a big demonstration is rarely seen. The leaders of the Central Got. employees including Coms. Shiv Gopal Mishra(AIRF)M.Krishnan, K.K.N.Kutty(Confederation) and other leaders addressed. It was declared by the leaders that Indefinite strike will take place from 23 November 2015, if the issues are not settled. It was an emotional meeting and unexpected. When I reached the AIBDPA CEC Meeting Hall at Jamnagar, many comrades came out to receive me. They were all senior comrades of the union and now the leaders of AIBDPA. But one comrade who came and shook my hands was none other than Com.A.C.Shah, the first Circle Secretary of BSNLEU who built the BSNL TU movement in Gujarat. He sacrificed his entire time and money touring all the places and organising which resulted BSNLEU becoming the first and mighty union. I had the opportunity to tour with him to many places. I could see with how much respect he is loved. His health is deteriorated, but the spirit is still high. Com.A.C.Shah, thank you for giving a chance to meet you after many years.